I was so looking forward to our weekend date night adventure wine tasting and became pleasantly surprised that we didn’t need to travel far. 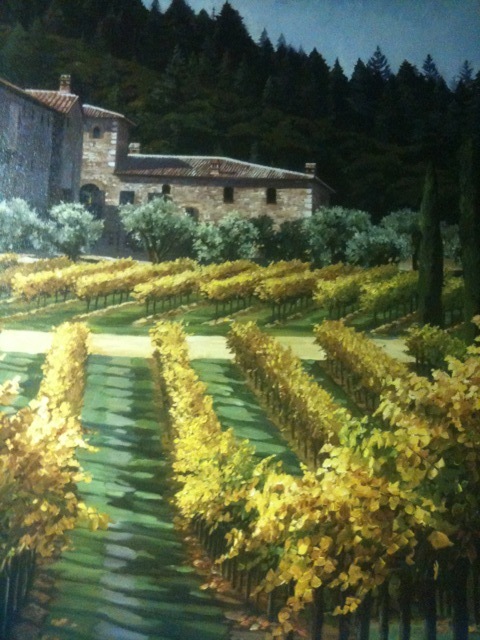 Right here, in Rancho Santa Margarita, is a little local gem called, Amazing Grapes Wine Store. They opened their store about six years ago and, like wine, they keep getting better with age. 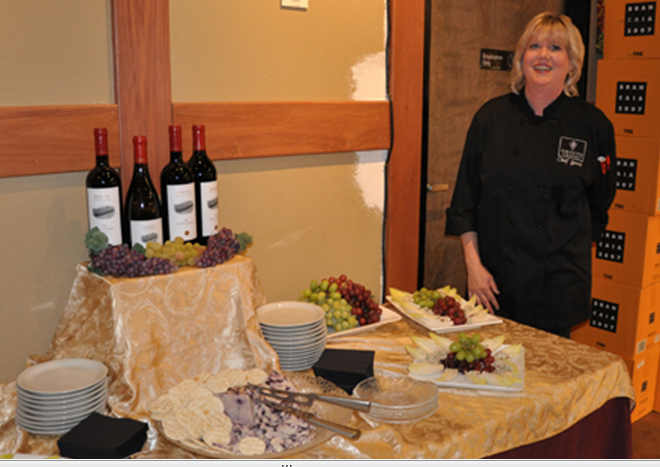 “Focusing on hospitality and graciousness, Amazing Grapes Wine Bar offers an extensive wine tasting experience. From the casual glass to the special event, our desire is to offer you a tasting and food experience that is truly remarkable. Our trained wine bar staff hand selects wines weekly for our bar as well as host a variety of wine tasting events – from current releases from a single winery to a regional or global perspective. As you walk into the wine store, you’ll notice isles of wines, champagnes, ports and craft beers from all different regions – Argentina, Austrian, Australia, Chilean, French, German, Italian, New Zealand, Portuguese, South African, Spanish, Washington, and of course, throughout California. Continue to follow your nose toward the back, left-hand corner where you’ll find a handsome wine bar and tables for dining as well as beautiful vineyard artwork that sets the tone of where you really want to be. Our server, Amanda, was a sweet gal who had just moved back here from Paso Robles. 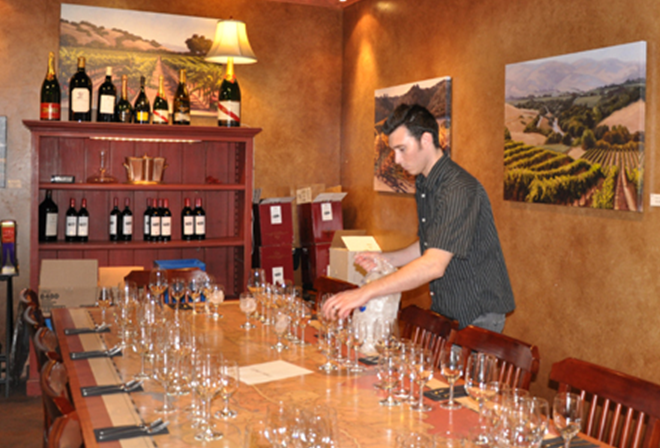 We were also visited by Lisa, an Artesa Vineyards expert who guided us through a very enjoyable wine tasting. And even Chef Gerri could steal away from her beloved kitchen to come out and say hi to the patrons. To start off with, Cindy, Andrew, Ken and I so enjoyed the Figgy Cheese ($7) – rosemary-infused goat cheese, studded with black Mission figs, fig jam topping, & crackers. To die for! I didn’t even know I liked figs and the goat cheese really did something for me. The next day I actually had a dream of this appetizer, weird I know, but I must have it again! Next, we shared a Seasoned Salad ($6) – baby spinach, dried cranberries, feta cheese, candied walnuts, & balsamic vinaigrette, so enjoyable with the 2008 and 2009 Artesa Chardonnay Carneros (& the Reserve) we were sipping. At this point, Cindy and I were perfectly content. Our husbands, on the other hand, needed something a little more substantial. Ken ordered the Beef on “Weck” ($8) – roast beef on salty kummelweck roll, dipped in au jus, served with a side of horseradish — unique staple of Buffalo, New York, right here in RSM! He cut off portions of his hearty sandwich for each of us, and I must say it was quite good, especially with the 2006 & 2007 Artesa Pinot Noir Carneros we next began tasting. One of the servers, whom we became friendly with, named “Shawna, the Wine Wench” highly recommended the Verdura Pizza ($8) – artichoke hearts, spinach, tomato, basil, and mozzarella cheese. Now we’ve had a lot of pizzas in our days, but I must say there was a little extra cheesy magic in this one – the wench was right! As if that wasn’t enough, I had to try the Truffle Mac & Cheese ($11) – pasta shells enrobed in creamy truffle béchamel, and crunchy panko topping – a mature mac & cheese, not to be wasted on little ones and soooo enjoyable with our 2007 Artesa Pinot Noir Carneros Reserve tasting. As any wine lover craves, a chocolate dessert was in order. We all overly enjoyed Dark Chocolate Clusters ($3) – house-made confection of dark chocolate, Spanish walnuts, dried cherries and a hint of ginger – simply Amazing! We ended the evening with a nightcap of Port. Thank goodness Ken was our designated driver. I think we passed him a few extra “Clusters” and he was perfectly happy! The next time I visit Amazing Grapes, I’m going to try their intriguing Fromage and Salumi, selection of a variety of cheeses, and Italian Prosciutto di Parma – Italian ham that has been aged 10-12 months using only one ingredient – salt; as well as their Italian Genoa Salami – seasoned with garlic, salt, black and white peppercorns, fennel seeds and wine. My mouth is watering already! I would highly recommend you consider Amazing Grapes Wine Store as a convenient source for your holiday shopping this season – it’s a great find for those “hard-to-buy-for who have everything”. Check them out at www.amazinggrapeswinestore.com. Thank you Greg Schroeder (GM) and Mike DeVries (Store Mngr) for your hospitality and helpful staff – everyone was delightful and I look forward to coming back again soon!